Zoonotic diseases, such as the plague and Ebola virus, jump from animals to humans. Often, but not always, such interspecies transmission occurs following mutations in the pathogen’s genome that make it more suitable for targeting a new host. But, infectious disease is not a one-way street. This same evolutionary process also makes possible “reverse zoonosis” (more properly dubbed zooanthroponosis) — i.e., the transmission of disease from humans to animals. Now, an international team of researchers has discovered that a strain of Staphylococcus aureus, which previously only infected humans, jumped into rabbits about 40 years ago. Shockingly, it only took a single mutation for such a dramatic change to occur. The authors report their findings in the journal Nature Genetics. Notably, Panel A shows that merely 300 bacteria from the rabbit-derived ST121 strains were sufficient to cause infections in 70% to 80% of the rabbits. 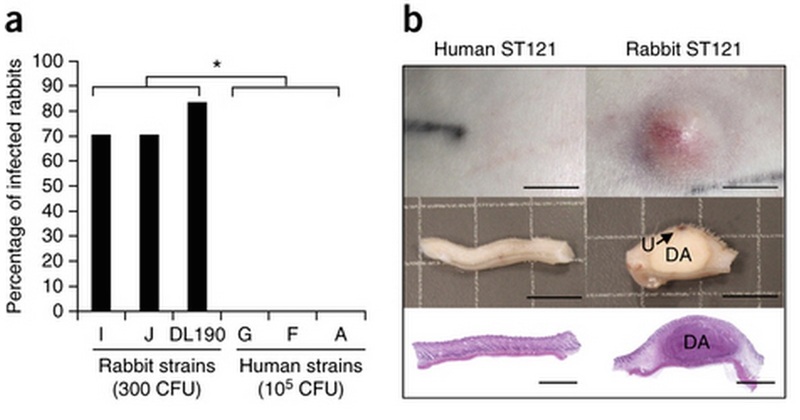 However, a gigantic dose of 100,000 bacteria from the human-derived ST121 strains was completely harmless. The authors then set out to determine why this was the case. A phylogenetic analysis of several ST121 whole-genome sequences, combined with an estimate of how quickly mutations occurred, suggested that ST121 jumped from humans to rabbits sometime around 1976. The authors identified several candidate genes that they believed to be responsible for the human-to-rabbit transition. Their subsequent investigation led them to a gene called dltB, which encodes a somewhat enigmatic membrane protein. 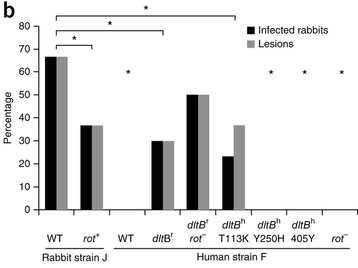 Draw your attention to “Human strain F.” Note that the natural human-derived strain (called wild-type and listed as “WT” in the figure) is unable to infect rabbits. However, the strain carrying the threonine-to-lysine mutation (T113K) infects rabbits. This one small change was sufficient to change ST121 from a strain that infected only humans to one that could also infect rabbits. The authors then tried to determine why this mutation had such an effect. Unfortunately, their investigation hit a brick wall, though they did rule out several possible explanations. The takeaway message from their research is that the ease with which pathogens can hop between species is rather unsettling. We should always remember that as humans continue to expand our footprint around the globe, we may be only one mutation away from being infected with a strange and dangerous new pathogen.